Today I intend a kind of introduction. In tomorrow’s lecture, we shall begin to try to give a more or less complete picture of the questions of social and political economy that humanity today must set before itself. The subject of economics, as we speak of it today, is in reality a very recent creation. It did not arise until the time when the economic life of modern peoples had become extraordinarily complicated in comparison with earlier conditions. As this course is intended primarily for students of political economy,† it is necessary by way of introduction to point out this peculiarity of the economic thinking of today. After all, we need not go very far back in history to see how much economic life has changed, even during the nineteenth century. We need only consider this one fact: England, for example, already had during the first half of the century what was, practically speaking, the modern form of economic life. There was comparatively little radical change in the economic structure of England in the course of the nineteenth century. The great social questions that arise out of economic questions in modern times were being asked in England as early as the first half of the nineteenth century; and those who wanted to think about social and economic questions in the modern sense could pursue their studies in England at a time when in Germany, for instance, such studies would have remained unfruitful. In England, Lecture 1 From Industrialism to World Economy Dornach, July 24, 1922 2 rethinking economics above all, the conditions of trade and commerce on a large scale had already come into being by the first third of the nineteenth century. Through the great development of trade and commerce in the economic life of England, a foundation was already there in the form of trade capital. In England, there was no need to seek for any other starting point for modern economic life. They simply had to go on with the trade capital resulting from the consolidation of trade and commerce, even as early as the first third of the nineteenth century. Starting from this time, everything took place in England with a certain logical consistency; we must not forget that the whole of this English economic life was possible only on the basis originally given by England’s relation to her colonies, especially to India. The whole of the English economic system is unthinkable without the relationship of England to India. In other words, English economic life, with all its facility for evolving large sums of capital, is founded on the fact that there lies in the background a country that is, as it were, virgin economic soil. We must not overlook this fact, especially when we pass from England to Germany. If you consider the economic life of Germany, you will see that in the first third of the nineteenth century it still essentially corresponded to economic customs that had arisen out of the Middle Ages. 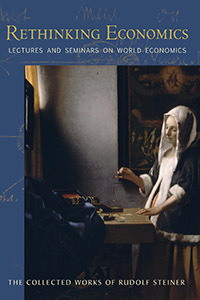 The economic customs and relationships within Germany in the first third of the nineteenth century were absolutely old: consequently the whole pace of economic life was different in Germany from what it was in England during the first third, or even the first half, of the nineteenth century. In England, during the first half of the century, there was already what we may call a reckoning with quickly changing habits of life. The main character of economic life remained essentially the same, but it was already adaptable to quickly changing habits. In Germany, on the other hand, habits of life were still conservative: economic development could afford to advance at a snail’s pace, for it had to adapt itself only to technical conditions that had remained more or less the same over long periods, and to human needs that were not rapidly changing. But in this respect a great transformation took place in the second third of the nineteenth century. Then there rapidly took place an The Transition from Industrialism to World Economy approximation to English conditions: a development of the industrial system. In the first half of the nineteenth century, Germany had been in all essentials an agrarian country—now it was rapidly transformed into an industrial country, far more rapidly than any other region of the earth. But there is an important fact in this connection. We might describe it thus: In England the transition to industrial life took place instinctively; nobody knew exactly how it happened. It came as a natural event. In Germany, it is true, the medieval character still existed in the first third of the nineteenth century. Germany was an agrarian country. But while the outer economic conditions were taking their accustomed course in a way that might almost be called medieval, human thinking was undergoing a fundamental change. It came into the consciousness of human beings that something altogether different must now arise, that the existing conditions were no longer appropriate for the time. Thus the transformation of economic conditions that arose in Germany in the second third of the nineteenth century took place far more consciously than in England. In Germany, people were far more aware of how they entered into modern capitalism; in England, people were not aware of it at all. If you read today all the writings and discussions in Germany during that period concerning the transition to industrialism, you will get a remarkable impression, a strange impression, of how the people in Germany were thinking. They actually looked upon it as a real liberation of humanity; they called it liberalism, democracy. Moreover, they regarded it as the very salvation of humanity to get right out of the old connections, the old binding links, the old kind of corporation, and pass over to the fully free position (for so they called it) of the individual within the economic life. Hence in England you will never meet with a theory of economics such as was developed by the people who received their education in Germany at the height of the period that I have just characterized. Schmoller, Roscher† and others derived their views from the ideal of this “liberalism” in economics. What they built up was altogether in accord with this ideal, and they built it with full consciousness. The English would have thought such theories of economics stale rethinking economics and boring; they would have thought that one should not trouble to think about such things. Look at the radical difference between the way in which people in England talked about these things (to mention even a man like Beaconsfield, who was theoretical enough in all conscience) from the way in which Richter or Lasker or even Brentano† were speaking in Germany. In Germany, therefore, this second period was entered into with full consciousness. Then came the third period, the period essentially of “the state.” It is true that as the last third of the nineteenth century drew near, the German state was consolidated purely by means of external power. What was consolidated was not what the idealists of 1848, or even of the 1830s and on, had desired; no, it was the state that was consolidated, and moreover by sheer force or power. And this state gradually laid claim to the economic life for its own purposes, with full consciousness. Thus, in the last third of the nineteenth century, the structure of the economic life was permeated through and through by the very opposite principle as had been in the previous period. In the second third of the century, economic evolution had been subject to the ideas of liberalism. Now its evolution became altogether subject to the idea of the state. This was what gave the economic life in Germany, as a whole, its stamp. It is true that there were elements of consciousness in the whole process, and yet in another sense the whole thing was quite unconscious.